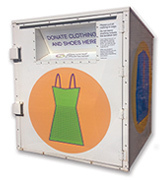 Your tax-deductible donation provides free clothing to people in need in our community. Thank you for your compassion and generosity. If your gift is in honor of or in memory of someone special, please include the person's name, any special acknowledgement requests, and all contact information in the memo or notes field of PayPal and Network for Good donations or in the envelope with your check. Please do not include cash or a check with a clothing donation. Second Chances, Inc. is a tax-exempt 501(c)(3) nonprofit organization. Financial contributions are tax-deductible to the full extent allowed by law. We raise 100% of our budget from the generous contributions of individuals, corporations, foundations, and other community organizations. Second Chances reuses and recycles clothing, shoes, and accessories so that homeless and lower-income people feel confident and valued as they take their first steps toward brighter futures and, as a community, we can minimize the amount of apparel going into local landfills. Give funds, donate clothing, or volunteer to help our neighbors in need and our planet!